Then bids on it themselves…. And were the only bidders! This was written by admin. Posted on Wednesday, February 6, 2019, at 10:41 am. Filed under Uncategorized. Bookmark the permalink. Follow comments here with the RSS feed. Post a comment or leave a trackback. We should sue Colleen for the money. #2 i absolutely agree! I’m sure they will uncover many more dirty dealings between her and Dumb Doherty! I sure hope that they can hold them accountable and bring them to court! 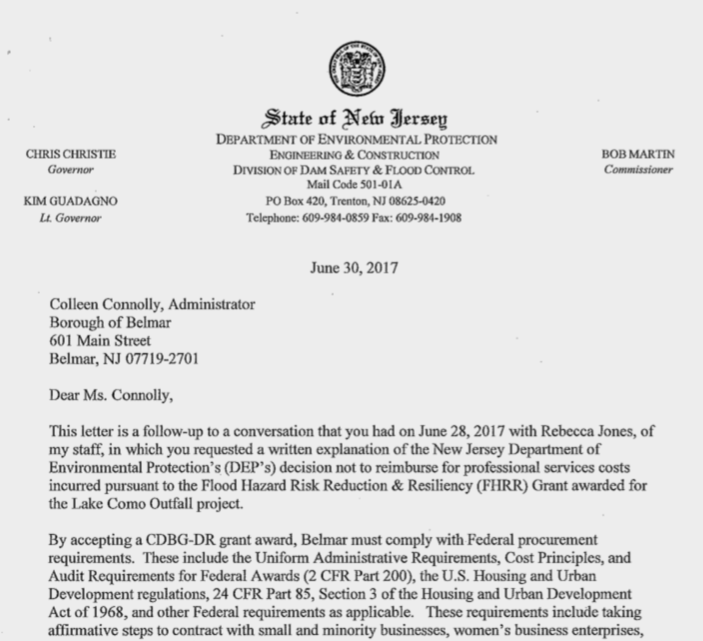 Was the 2017 letter from an OPRA to the state or did the Borough still have it on file? This is absolutely collusion by the parties referenced in the above letter. How much $$$ did maser pay Belmar politicians over the course of Doherty, McGovern, Nicolay, Brennan and Janis whatever Administration? 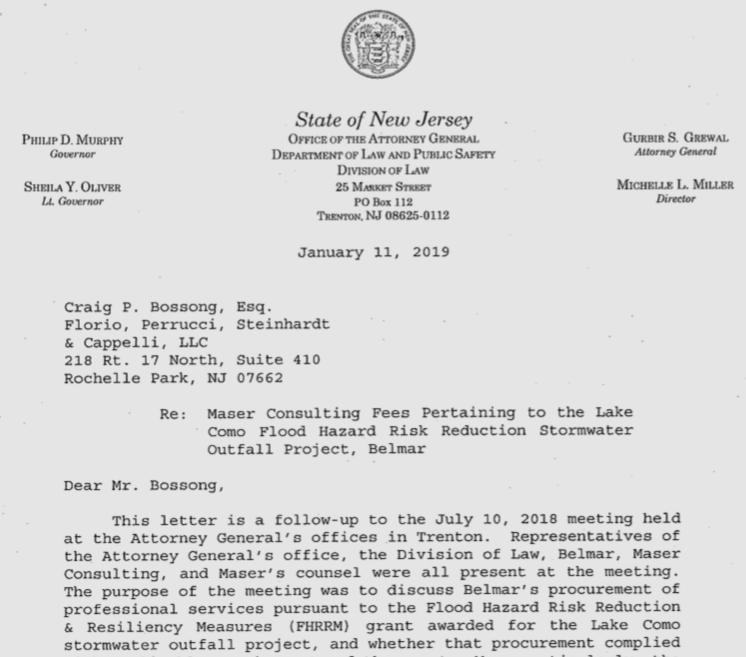 Reasons obvious that Pay to play violators cost Belmar taxpayers millions. Maser makes tons of campaign contributions but I don’t believe ever to anyone in Belmar. Maybe an enterprising individual could decide to check the League of Municipalities hosting by Maser AS FAR back as in November 2018 backward to 2010. An interesting picture will be sketched out. Maybe a former Birdsall employee would be willing to talk now. Seems to me the first question is do we have any recourse against Maser,i think as i have said elsewhere , despite what i consider to be either massive stupidity,incompetence or malfeasence we have little hope of finding a way to hold the culprits responsible financially. On the other hand our counsel should look at what liability Maser ,in a clear conflict of interest and surely with knowledge of the meetings with the state in 2014 or 2015 and the letter of 2017,might have. Other professionals paid by the boro to avoid just this type of thing should be looked at as well. That or we chalk it up as another expensive boondoggle from our oh so great Doherty regime. #7 hit the nail on the head. Perhaps there were no visible signs(political contributions) of influences, you not count out the possibility of other forms of favoritism (cash bribes in someone’s pawket).Oh, and by the way, where idi all of the Doherty regime supporters go. CLAIRE. Cricket, cricket. Or Brennan or Magovern. Their phone isn’t ringing – they haven’t heard from their “friend” Matt since he went to AC. The realization has hit them I’m sure. Let’s give them time served and call it a day. #13- No, tar and feather and hanging in time square. The good ole days. Bring them back. Talk about being a deterring sight. Or jails would be empty. Stop babying these people and hold them accountable. Call the FBI or sue these idiots. Pillories in Pyanoe Plaza. Public humiliation. Arrogance and self righteousness should be addressed. Then go to church and pray, accusers and the accused. oo oo “bidder fatigue” excuse for Taylor Pavilion. Job given to high bidder, then have borough employees do much of the work toward the end. Over pay the contractor to possibly get money back via miscellaneous contributions for this or that? Miracle is that the state gave Belmar the 4.5 million or so. Cynical me would ask, “who do you know”? 17: my guess is that you and Belmar never heard of “Clawback” from STNJ. #18 So, enlighten us. How will the state get back it’s money? forensic audit? And Matt skips on down to AC with a cushy job. Laughing on his long ride down the parkway. Saying to himself Its YOUR MESS Now Belmar. Good luck Walsifer!! So what I knew of malfeasance in the bidding process, by the time anyone finds out I’ll be long gone. Colleen wont tell anyone She’s a good flunky. The council all had their blinders on and thought I was just the cats meow. I’ll leave Brian Magovern in charge, he’ll be sssoooo happy to be Mayor and he doesn’t question a thing. And Jen… Well…. she won’t believe a word of any of it… even with proof right in her face…and Tom Brennan really wants that plastic bag ordinance. That will keep him happy. So long SUCKERS!! I can leach on to Cory Booker’s run for pres. and obviously Governor Murphy doesn’t know who or how his people get hired any way!!!! I’m the king of the world!!!! I believe that we are doing AC and the rest of the State a huge disservice if this information is not gathered, in a professional manner and delivered to the Board Matt sits on. He has to be stopped. #22 Exactly my thoughts, and he still lives in town and doesn’t hide his face. A true narcissist.